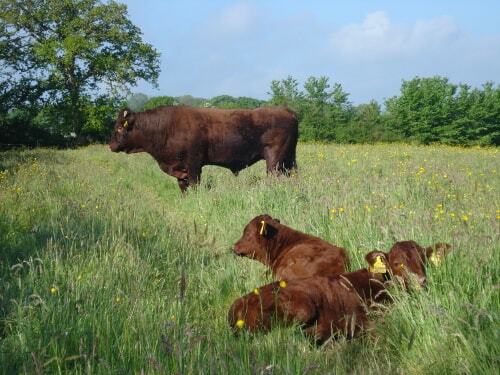 Today we said goodbye to our small herd of Devon Ruby cattle as they left for another farm on Exmoor. There's a nice symmetry about this as Exmoor is where Devon Rubies originated. We built the herd up from scratch many years ago and were sad to see them go, even though they are going to a good home. Priscilla Pig farrowed this month in a rather relaxed way and at a very civilized time of mid-morning. This was very considerate to her human midwife. She and her piglets are doing very well. Priscilla is demanding regular shower baths because it has been so hot. In fact keeping all the pig wallows and water troughs topped up is becoming a full-time job in this phew-what-a-scorcher-so-far summer. How does a pig demand a shower bath, you ask? She either throws her trough about when she sees you or she tries to get under the hose pipe as you re-fill it. Clever pigs. The sheep are keeping cool by lying in long grass under apple trees in the orchard. Columbine, one of our first-ever lambs, died today at the amazing age of 16. She had a long and happy life, a particular way of bleating so that you could recognize her two fields away and a lot of attitude and backside. We raise a glass to her! And we still have Apricot, another 16 year old ewe going strong. Weather: blue skies and very hot again!